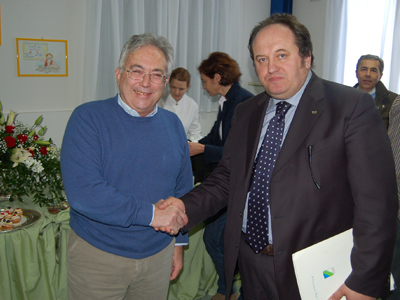 The Abruzzo Regional Councillor for veterinary health, food safety and cultural policies, Dr. Luigi De Fanis, paid a visit to Istituto G. Caporale's head office on the afternoon of Friday 18 March 2011. The Councillor was welcomed by the Institute's Director, Prof. Vincenzo Caporale, and met administrative staff and department supervisors for a presentation of the Institute's activities and projects. For a closer look at the Institute's work Dr. De Fanis, accompanied by Prof. Caporale, visited the data processing centre - the heart of national registry activities, the food safety and vaccine research laboratories, the mobile biocontainment laboratory and the epidemiological risk analysis centre.